I was fast asleep in Wanaka and in blissful ignorance when my Mum got a text from BA to say that my flights from Melbourne to Hong Kong and Hong Kong to London were cancelled! My flight from Queenstown to Melbourne was unaffected. It turned out that a typhoon had been forecast so the airport in Hong Kong was being closed as a precaution. BA were of no help and couldn't even guarantee to get me out of Melbourne within a further 2 days so my Mum took the bull by the horns and booked me onto a Qantas flight from Melbourne to London via Dubai. I found out the new arrangements when I woke to a stream of messages on Viber. In due course I checked-in at Queenstown and paid the usual excess bag fees (an occupational hazard if you are a ski racer) to take the bags all the way through to London. I was relieved to have off-loaded the skis etc and began to look forward to the trip home. I had been at Melbourne for nearly 4 hours and the flight was boarding when my name was called out over the tannoy and I was advised that Qantas wanted an extra 3300 Australian dollars (over £2000) to take my bags to London, and if I didn't pay, they were going to take them off the aircraft - I would also be unable to travel. I had no time to argue with them, I had to pay-up or not get home. I did manage to negotiate a slightly lower figure with them but it was still disgusting and they treated me very badly indeed. 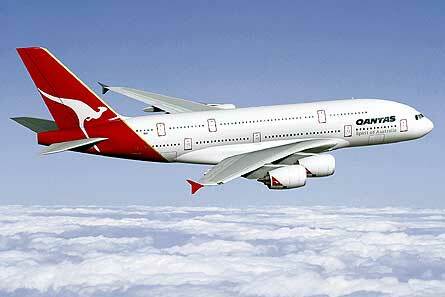 The Qantas A380 that I travelled home in. I was looking forward to home anyway but this nasty experience made my homecoming that much sweeter. Flying around the world with loads of luggage is definitely not the glamourous pass-time some people think it is!